The 2015 Omni Grand Slam Contest is Here! Share your top baseball pick for a chance to win one of four $100 gift cards! This year’s baseball championship series starts on October 27 and Omni Financial is ready for all the action! Who will win it all and take home the sport’s most prestigious trophy? Tell us your top pick for a chance to win a $100 gift card! Visit us on Facebook between 9/28 and 10/28. Submit your top pick for the championship team on or before 10/28. All participants who select the correct winning team will be entered into a random drawing for a chance to win one of four $100 gift cards! What is your prediction? Do you think you’ve got it all figured out? 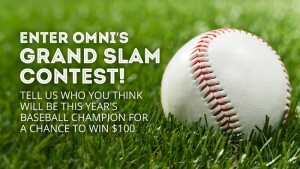 Enter the 2015 Omni Grand Slam Contest now! Visit Facebook for complete contest rules and details.